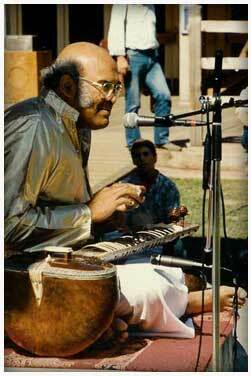 Bande Ali Khan (1826-1890) was a legendary musician and devoted follower of Sufism. 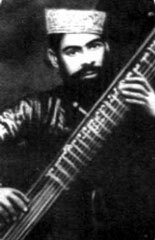 He was particularly fond of khyal singing, which he adapted to the Rudra Veena (bin), the instrument having until then been solely used to interpret the dhrupad style. 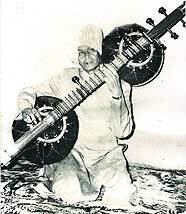 Being both an innovative musician and a charismatic character he paid little attention to strictly hierarchal society around him, he passed on his musical training freely to many musicians including the sitar, sarangi and harmonium. One widely accepted requirement for the recognition of a gharana is that there be at least three generations of practitioners who follow a consistently recognizable style attributable to the founder (Neuman 1974:200-201, Deshpade 1973:11). Leaving aside for a moment the question of style (since a verification of stylistic consistency before the present era is difficult due to a lack of documentation) , the six musicians described above would certainly seem to satisfy the generational requirements of a gharana. The three ustads, according to the genealogies they have given, have each studied with first- or second-generation disciples of Bande 'All Khan himself. 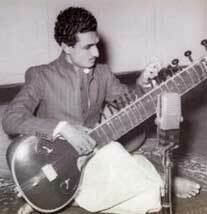 Ghulam Rasul Khan studied sitar with MajId Khan, but his own didactic influence is negligible, since he has had no disciple, and his musical influence on his younger brother has been only incidental. 'Usman Khan studied with Murad Khan (a direct disciple of Bande 'All Khan), and LatIf Khan (a disciple once removed via his father, Wapid Khan), as shown in Figure 2. Thus 'Usman Khan is simultaneously a second- and third-generation disciple in the tradition of Bande 'All Khan, while Ghulam Husain, having studied with 'Usman Khan, is simultaneously a third- and fourth generation shagird. 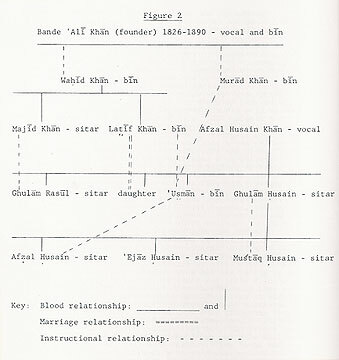 The genealogy of 'Abdul Halim Ja'afar Khan, who also claims a musical lineage from Bande 'All Khan, is more complex, since he studied with several teachers, but it does have a continuity of at least three generations of practitioners, (V.H. Khan 1959:220, Garg 1969:4334, Srita Stava 1957:225-7) often with multiple vertical links of instruction. It thus seems reasonable to accept, at least on the basis of musical genealogies, the actual existence of an instrumental gharana of Bande 'All Khan comprised of three parallel sub-gharanas, of which the musicians described at length in this paper are, taken collectively, one such sub-gharana. A certain amount of musical evidence for the existence of a distinct gharana of Bande 'Ali Khan is available on the basis of current performance styles. 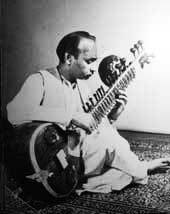 In recordings of Muhammad Khan, Ghulam Husain Khan, and 'Abdul Halim Ja'afar Khan, for example, there are certain basic similarities of style in articulation, ornamentation, and phrasing which distinguish these musicians from other sitarists. A technical discussion of these features is beyond the scope of this paper, but correspondences in the music of these three ustads is evident upon careful listening, even though each musician has a decidedly individual style. A second indication of stylistic consistency with the gharana (one which, incidentally, is not explicitly claimed by any of the principal subjects of this paper) is to be found in an apparent uniformity of instruction in the teaching exercises of both Muhammad Khan and Ghulam Husain Khan. This uniformity became evident to me in a meeting in 1965 with Syam Yodh, who had studied with both Muhammad Khan and his son Ra'is. Yodh recognized in my playing a sequence of gat (composition) and paltas (variations) learned from Ghulam Husain Khan which were virtually identical to those he had learned in the initial stages his training. I have subsequently heard numerous equivalent training exercises from students learning in other sitar traditions, and have found them very different from those taught by Muhammad Khan and Ghulam Husain Khan. Moving beyond questions of musical genealogies and stylistics, a further confirmation of the existence of the gharana of Bande 'Ali Khan is to be found in various internal links through marriage among the various sub-gharanas. For example, according to Ghulam Husain Khan and 'Usman Khan, their sister was one of LatIf Khan's wife, (his second wife was the niece of the celebrated sitarist Ustad 'Inayat Khan), and their female first cousin was married to Murad Khan (as noted above, both Murad Khan and. LatIf Khan were 'Usman Khan's ustads). Another female first cousin was married to 'Abdul Hallm Ja'afar Khan's grandfather. These marital connections, obviously, offer no explicit proof of a stylistic coherence within the gharana , but they do bespeak a social cohesiveness which would tend to reinforce a musical cohesiveness through a freer interchange (due to family loyalties) of musical materials. The aspect of social cohesiveness introduces the last element in this discussion of gharana: the question of the existence of an Indore gharana. It is evident to anyone well acquainted with members of the three sub-gharanas outlined above that these musicians meet on the sort of basis that suggests a connection both musical and familial. But there are other musicians who apparently occupy a very similar social ground in the perceptions of the six subjects of this paper, even though the former have no musical genealogy traceable to Bande 'Ali Khan. These individuals include the late vocalist Ustad AmIr Khan, who identified his tradition as the Indore gharana; various members of the Dagar family, both instrumentalists and vocalists, who identify themselves as exponents of The Dagar bani (one of the four major traditions of dhrupad music); and Ustad Vilayat Khan and his younger brother, Ustad Imrat Khan, who trace their musical lineage back through their father, Ustad 'Inayat Khan, to their grandfather, Ustad Imdad Khan. Insofar as the Indore gharana exists as a conceptual entity, it may be said to consist of these musical families, as well as those in the gharana of Bande 'Ali Khan as discussed above. It is significant that AmIr Khan and the Dagar and Imdad Khan families have been affiliated, for substantial periods at various times in the past, with the princely state of Indore. (e.g. Report 1918, 1920) Yet since the Dagar and Imdad Khan families enjoy a widespread reputation as distinct gharanas, it would be superfluous for them to identify with an Indore gharana. Amir Khan is in many respects the sort of figure who may have generated the beginnings of a gharana of his own in vocal music, and it happens that he has chosen to identify his distinctive style as that of the Indore gharana. (Deshpande 1973:648) Finally, as already demonstrated, the instrumental gharana of Bande 'AlI Khan has itself a clearly defined integrity. The concept of a larger Indore gharana, then, must have some other basis for definition than that of stylistic consistency and continuity. Such a basis becomes apparent when one looks beyond the musical identifications of all the families listed above to find a network of marital bonds and consequent familial interconnections much more complex and extensive than would be evident from surface appearances. 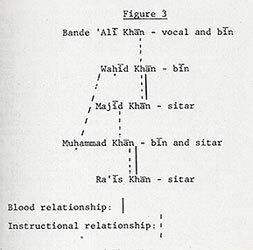 A few examples should suffice to evoke the nature of this network: Alli Bande Khan, the grandfather of the currently performing Dagar Brothers, married a daughter of Bande 'Ali Khan; (Neuman 1974:185) nieces of 'Inayat Khan married, respectively, the two brother~ MajId Khan and Latif Khan; and both Muhammad Khan and Amir Khan married sisters of Vilayat and Imrat Khan. (Sen 1973:202) It would thus seem that the "Indore gharana" corresponds in some respects to what Neuman (1974:205-6) distinguishes as biradri (lit. brotherhood, a social group united by common origin and some degree of endogamy) with strong historical links to the state of Indore. The interrelating functions of gharana and biradari may now be summarized in the context of the gharana of Bande 'All Khan and the "Indore gharana". 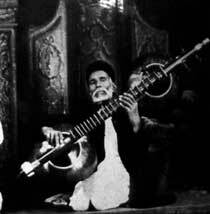 The gharana serves as the foundation for musical training, in that exercises given in the initial stages of musicianship have been perfected through generations of tradition, to serve both as structures designed to develop skillful hands, and as a kind of compendium of musical grammar to be used in future improvisation. The gharana also serves as a pool of musically consistent ideas which the student, at later stages, may imitate exactly without departing from the style of his original training. The biradari (in this case the "Indore gharana") serves as an effective and controlled federation of internally consistent stylistic pools (gharanas) among which there is a cautious but ultimately enriching series of coalescence's in the development of each individual musician. These functions explain the rationale behind Ustad Ghulam Husain Khan's instructions to me when I left India, after two years of intensive study on the sitar, without any explicit musical theory. His instructions were that I should (1) practice the specific exercises he had taught me until they became automatic; (2) listen to and imitate recordings of his playing, as well as that of Ghulam Rasul Khan, 'Usman Khan, and Afzal and 'Ejaz; and (3) listen occasionally to--but not imitate--recordings of the various ustads in the "Indore gharana." By following his instructions, I like any other shagird in the gharana of Bande 'All Khan--would have access to a compendium of fundamental techniques which may be developed, generatively, into increasingly elaborate and complex--but stylistically consistent--patterns of musical performance; at the same time, there would be the possibility of illumination from listening to--but not copying--the performances of the musically trustworthy ustads in the biradari of the Indore gharana. This fundamental uniformity of basic technique and non-verbal "theory" combines, therefore, with a familial bonding through marriage, to provide for the six musicians discussed above a concept of gharana which exists on two levels. On the social level, the gharana serves as a perceived source of prestige from which a sense of encouragement and supportiveness can be drawn. But it is on the musical level, where both cohesiveness and adequate diversity of style exist in actuality, that the gharana serves in the pursuit of ustadi, as a generative matrix which is still essentially whole, in spite of the transformations wrought among the members of the gharana by the developments of the past thirty years.